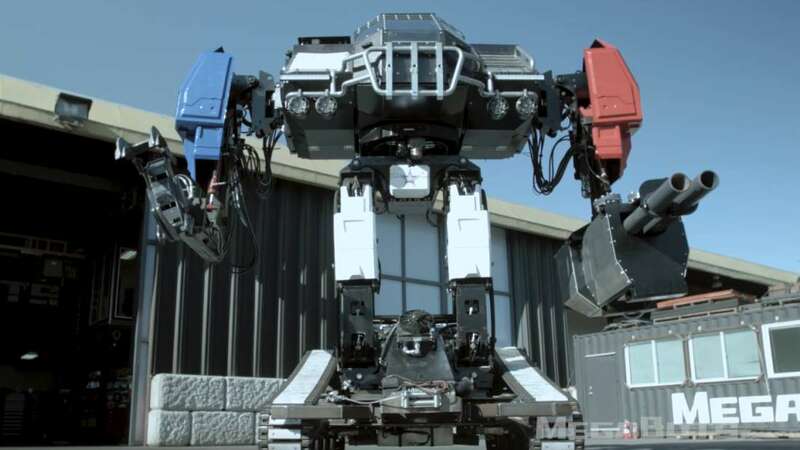 The US and Japan are about to engage in a giant robot fight, and you’re all invited to watch. No, we’re not kidding, although if you’re thinking on the scale of Pacific Rim or anime shows like Evangelion or Gundam, you might need to revise your expectations a little. Billed as the “world’s first giant robot fight,” the battle – which has already taken place in secret – will stream on Twitch on October 17 at 10pm ET. It’s been two years in the making, so, ladies and gentlemen, place your bets now. The promotional video for their war machine is exactly as American as you’d expect: bombastic, showy, and genuinely imposing. Engaging in a trial of sorts, the impressive creation slides around corners with ease, smashes through some barrels with its claw-like left arm, and fires projectiles quite accurately at several others. At one point, a car explodes as it’s hit by an explosive projectile. When faced with another war robot armed to the teeth – the “enemy megabot” – Eagle Prime literally rips its face off. Somewhere, a bald eagle probably beamed with pride. In Japan’s corner, you have Suidobashi’s Kuratas robot, weighing 5.9 tonnes (6.5 tons) and reaching a height of almost 4 meters (13 feet). A promotional video from 2012 takes on a slightly different tone to the American equivalent right from the offset, where it issues a disclaimer. It’s shown wandering around the streets of Tokyo quite peacefully, but in a follow-up video – one which responds to the Americans originally challenging them to the duel – they show off its punching prowess set to heavy rock riffs. So, who’s your money on? Will the Americans prevail, or will the Japanese dominate the battle? Tune in to find out!